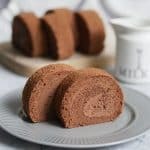 One of my husband’s favorite desserts is a chocolate swiss roll that we used to buy at a Japanese bakery on Robson street in downtown Vancouver. 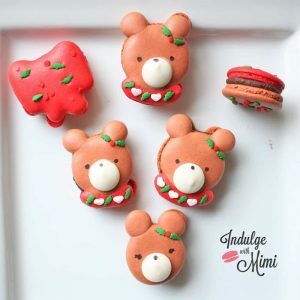 Every time we’d go there, there would be a few other desserts that would pique his interest by their attractive appearance but after trying several kinds, he eventually set his heart on getting this one particular chocolate cake every single time. (I hope that is a good indicator of his decision making style for life partners too HAHA.) 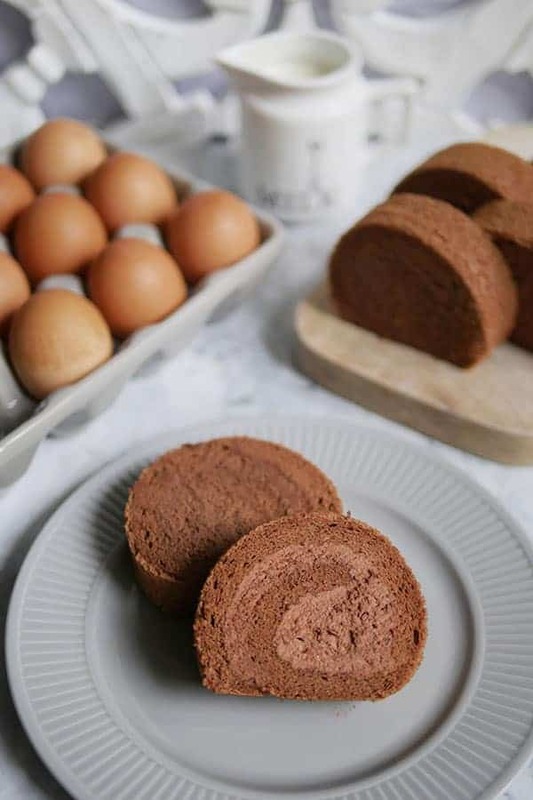 The cake roll is chocolate flavoured and consists of a soft fluffy chiffon cake base which is rolled up and filled with a light and airy chocolate whipped cream. 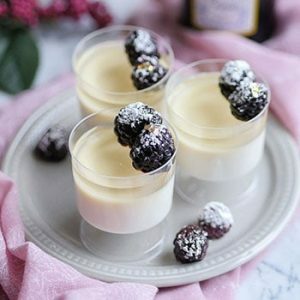 Like most popular desserts in Asia, it has a light texture and creamy taste and most importantly, it’s not too sweet. We had a good few years of dropping by the little bakery to pick up this heavenly cake until one day, to our dismay, it had closed down. 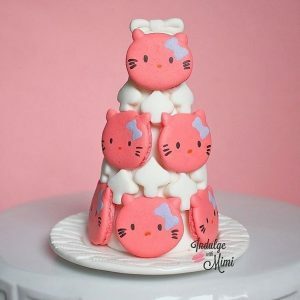 I was never able to find a replacement dessert for hubby so I decided that if there was a cake I wanted to recreate in my kitchen, this would be the one! 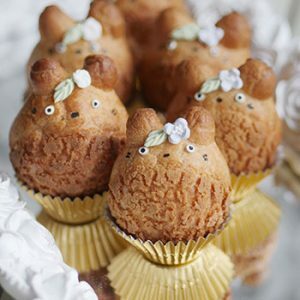 One of the most appealing aspects of this cake is the soft and fluffy cake body. 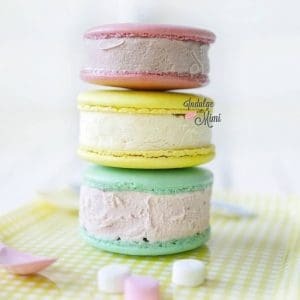 I have found cake rolls in other Asian bakeries but I wasn’t able to find one with such a light airy texture. In developing this recipe, I experimented by making it 7 times, each with different ratios of flour, eggs, etc. 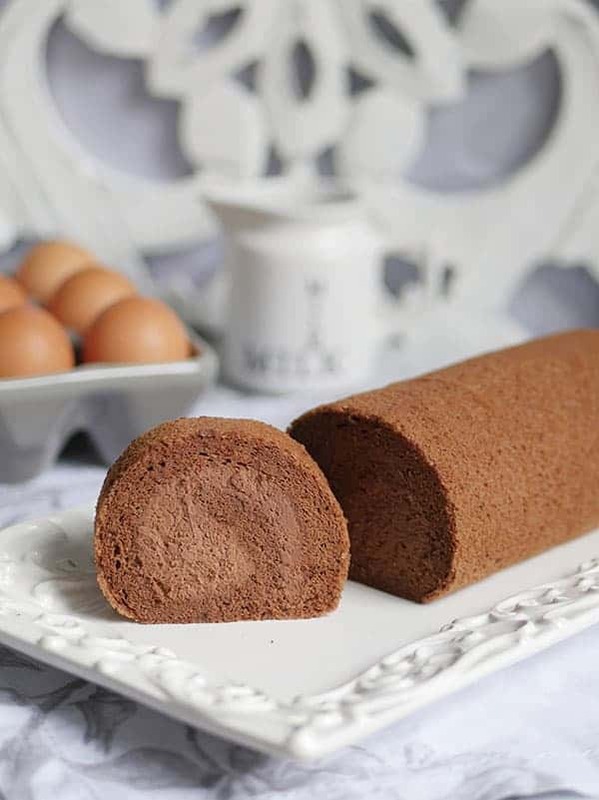 I think I finally developed the perfect recipe for a soft and fluffy chiffon chocolate cake which could be rolled into a chocolate cake roll. For the cake, I decided to use a chiffon cake technique vs. a sponge cake because it is lighter and fluffier. 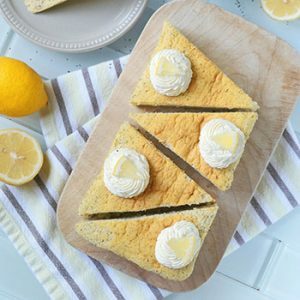 Technique-wise, the main difference between the two is the use of oil in a chiffon cake vs. butter in a sponge cake. Oil makes the cake lighter and more tender. 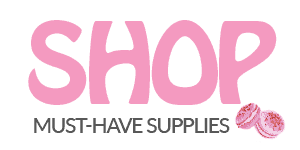 It is also great for refrigeration since butter hardens up in cooler temperatures. Another signature technique used in the making of chiffon cake is the separate whipping of the egg whites. 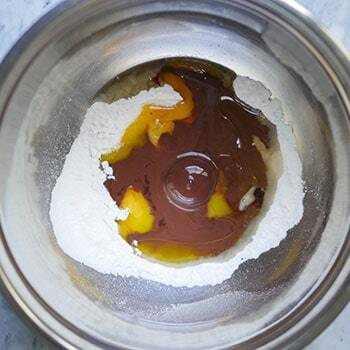 A flour mixture is first created with the flour, egg yolks and oil, next the whipped egg whites are then folded into this flour mixture to make the chiffon cake batter. 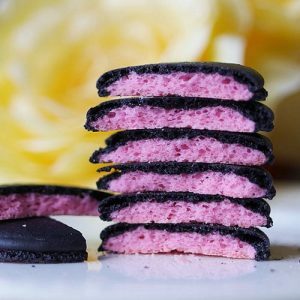 It’s an easy cake to master for you macaroners out there since you’ve probably brought egg whites to a stiff peak condition many times before. A strong and healthy meringue (whipped egg whites with sugar) is needed to act as one of the leavening agents in this cake. Egg whites should be whipped in a clean and dry non-plastic bowl since plastic tends to trap oil. Use a paper towel and wipe down the mixing bowl with lemon or vinegar before you start. Carefully separate the egg whites and yolks. Make sure no yolks are present in the egg whites. An egg separator can come in handy. Bring the egg whites to a stiff peak. This is characterized by egg whites that have a beak that points upwards (instead of slumped over) when the whisk is pulled out. Once the liquid (chocolate milk in our case here) is introduced to the flour, do not over mix. This will produce more gluten, making the cake less tender. Use a gentle folding movement to incorporate the meringue into the wet flour mixture. Do not stir, this will prevent the air in the meringue from deflating. Rap the tray a few times on the counter to get rid of large air pockets. Add more cream along the short edge of the cake which is to be rolled first. This will prevent the cake from cracking due to large gaps in between the folds. 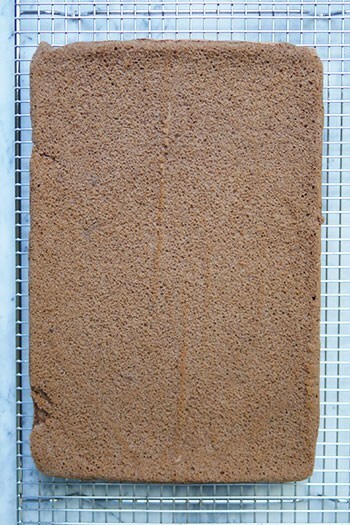 Instead of putting your hands directly onto the cake, use the parchment paper to push the cake onto itself as you roll. Fold gently and do not worry too much about rolling the cake very tightly. As long as the cream is spread out evenly (with a bit more along the short edge as per #7), the amount of cream in this recipe will allow the sheet cake to hold up without cracking due to large gaps. 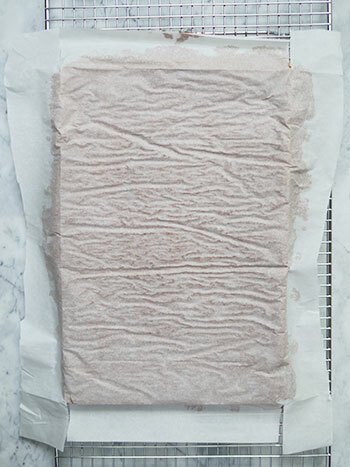 When peeling off the parchment, try to remove as much of the “skin” as possible. The cake looks better with exposed crumbs. I absolutely adore this cake and even after making 7 of these and eating most of it by myself for the purpose of “taste testing”, I can say I still crave for more. I really hope you enjoy this recipe as well. 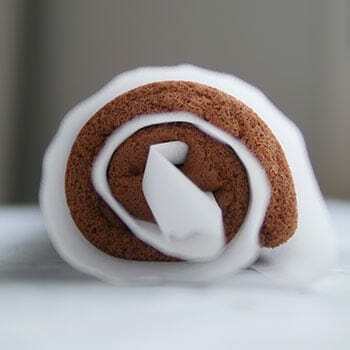 Japanese style chocolate cake roll made from a super soft and fluffy chiffon cake that melts in the mouth. Inside, it's filled with a light chocolate whipped cream. Airy and not overly sweet with all the chocolate goodness, it's so easy to indulge in the whole cake all by yourself! 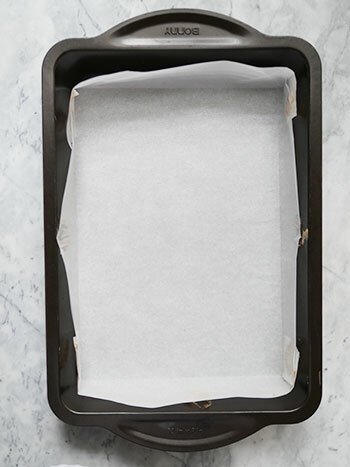 Line a 8 X 12" rectangular cake pan with parchment paper. 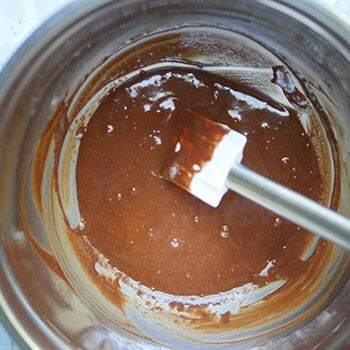 In a small sauce pan, heat the milk and cocoa powder on medium heat until powder is fully dissolved. Do not let the milk come to a boil. Keep stirring continuously while breaking down big clumps of powder. Once fully dissolved, set chocolate milk mixture aside to cool. 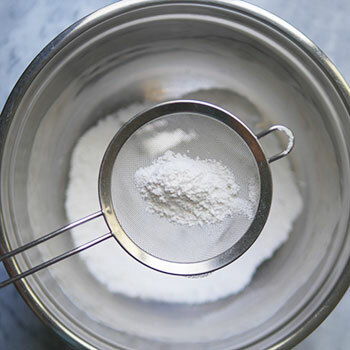 In a large mixing bowl, add in sugar, baking soda, cream of tartar and salt. Sift in cake flour, stir to combine. Create a well in the center. Inside it, add yolks, oil, vanilla extract and chocolate milk mixture. Stir to combine until fully incorporated, do not over mix. Set this chocolate-flour mixture aside. 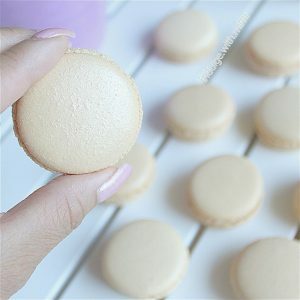 Increase speed to medium, once the whites become opaque and bubble size have tightened up, add sugar a little bit at a time. Gently fold 1/3 of the meringue into the chocolate-flour mixture to get it moving. Once incorporated, fold in the rest of the meringue. Do not stir. Use batter immediately. Dab a bit of the batter onto the sides of the parchment paper to keep corners together. Dab a little more onto the paper and stick it to the pan to prevent the parchment paper from tipping over into the cake batter. Pour into lined cake pan from one spot, spread out the batter evenly with an angled spatula. Tap the pan on the counter to release large air pockets. Bake for 14-16 min. at 325F until a skewer pulls out clean and cake springs back in the center. Let cool 5 min. in the pan before removing. 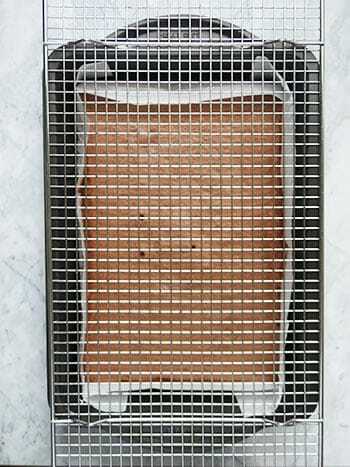 Place cooling rack over cake pan. 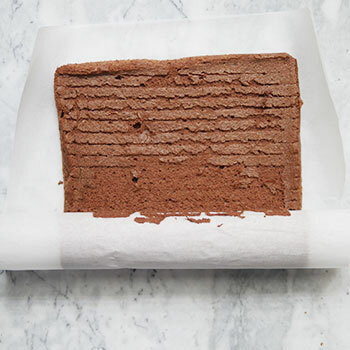 Flip cake over onto the rack, gently remove paper. The side facing up will eventually become the top of the cake roll. Try to remove as much of the "skin" as possible since the cake will look better with exposed crumbs. Let it sit on cooling rack for 5 min. Flip the cake over and start rolling, allowing the parchment paper to be in between the folds. This will prevent the cake from sticking to itself. It's important to roll the cake before it cools completely, otherwise, it will crack while rolling. Let it cool in this wrapped condition while making the chocolate whipped cream. Place a mixing bowl and beaters in the freezer to chill. It will help the cream whip better. 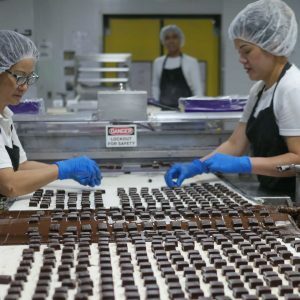 Chop up chocolate into small pieces. 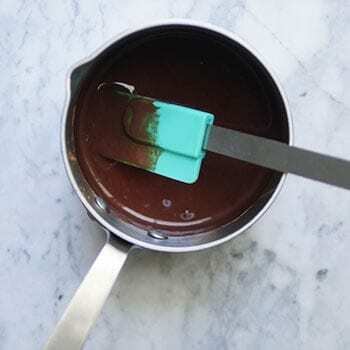 Place chocolate in a small pot along with the cream. Heat over medium heat until chocolate is fully melted. Do not bring to a boil. Let cool to room temperature then place in the fridge to chill. Check on it every 10-15 minutes and give it a gentle stir. 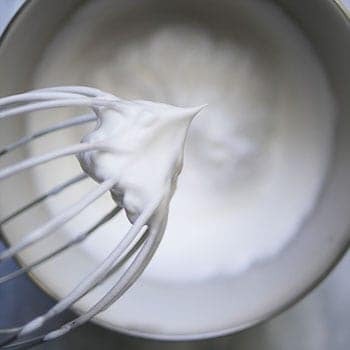 It should be chilled before whipping but do not let it cool for too long as it will become too stiff to whip. 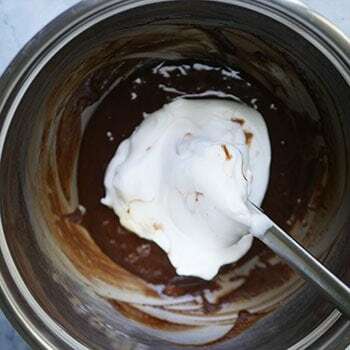 Place the chocolate and cream mixture in the chilled mixing bowl, then beat on low speed and slowly increasing to medium. Stop when it start to get stiff. Do not over whip. Very carefully unroll the cake. Gently add one even layer of the chocolate whipped cream onto the unrolled cake. Very gently roll the cake back up using the parchment paper to help push the cake onto itself. This will help prevent cracking. To further prevent cracks, add more cream along the short edge that is folded first and do not try to roll the cake too tightly. Cut off the sides before placing on a presentation plate. Enjoy! 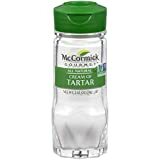 Cream of tartar can be substituted with double the amount of lemon juice or vinegar. Always whip egg whites in a clean and dry boil non-plastic bowl free of oil and water. Use a clean paper towel to wipe down the bowl with some lemon or vinegar. Stiff peaks is characterized by egg whites that have a beak that points upwards (instead of slumped over) when the whisk is pulled out. 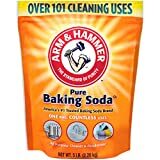 Hi Mimi, can I exclude cream of tatar and baking soda in this recipe? No, you will need them both for the cake to rise. You can substitute both with 1 tsp of baking powder. 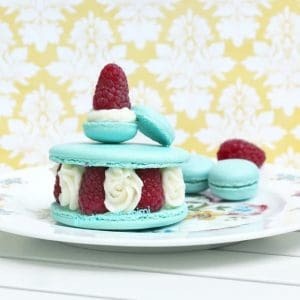 You will still need cream of tartar to whip the egg whites but you can sub that with double the lemon juice. I just made this recipe and it turned out perfectly! 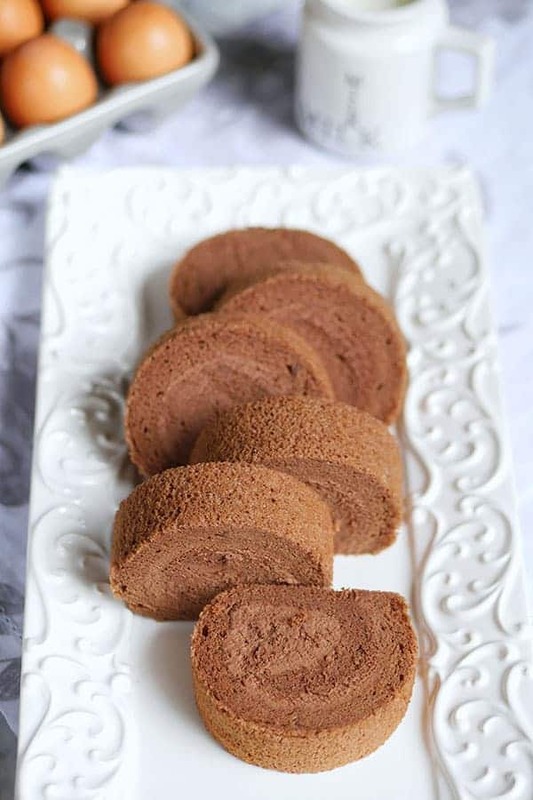 It tastes just like the chocolate Swiss rolls that you can find in bakeries all over China too. The cake is light and airy, and the cream is heaven. That’s so wonderful to hear! Thanks for letting me know. This is one of my most beloved cake recipes as well. Hi Mimi! 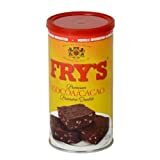 I am just wondering if instead of the 5 tsp of cocoa powder…I add 5 tsp of the cake flour and I add 1 tsp of vanilla extract..will it make a white/vanilla roll? 🙂 will it change the whole consistency of the sponge cake? Thank you! I can’t confirm since I haven’t tried. I don’t think it will change the consistency much. Let me know if you do! Hello I am wondering if I am using a bigger baking sheet like 11’X 17’ inch will this recipe works? Or I should make adjustment? If so please advice how can I adjust the measurement. Thank you. Hi – just to clarify, does your recipe suggest vegetable oil but not to use Canola? And if so, why not Canola? Thanx. That was purely my mistake. Ex. should have been e.g. For example, use a neutral vegetable oil like canola. Good luck! Great – it did cross my mind that “ex” might have been used as For Example. Trying cake recipe shortly. Will let you know how I go. Cheers! I made this recipe on my daughter ‘s birthday it came out amazing, everyone loved it! Can Ichange it to vanilla flavour? I’m so happy you had a chance to bake it and had such a good result with it. I will come out with a vanilla flavoured recipe soon. Sorry, I haven’t had time to finish the recipe yet. Love your recipe! Is so good! 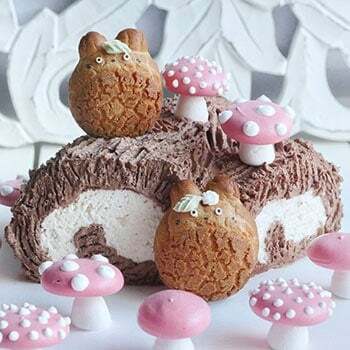 I make it into a log cake! Yummmy! 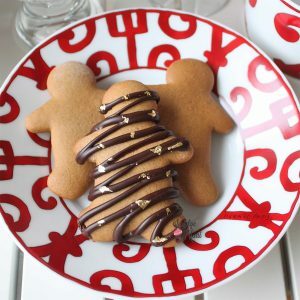 Do you happen to have this recipe but without the cocoa? I’m so happy you had such great success with the recipe and that you found it perfect in texture in sweetness. 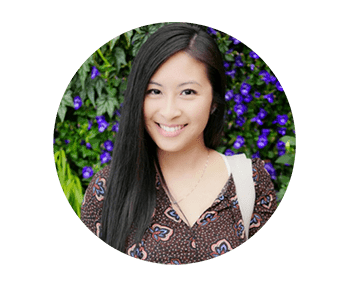 Thank you for sharing your experience with baking in a 6″ cake pan. I had a lot of trouble making this cake. I’m not sure I got the ingredient amounts correct bc it was written in meters. My batter did not look like your picture and my whipped cream did not stiffen up. What happened? 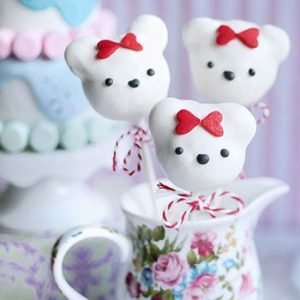 Hi Mimi. Thank you for sharing this great recipe. Can I use this recipe to make 1 layer of chocolate cake using the 8 in. round cake pan? Thanks. You’ll need to account for the different pan size to make sure the depth of the batter remains the same as the original. In this case, the batter will be able to fill two 8 in. round cake pans. Do not pour all the batter in this recipe into one 8 inch pan. Wow! You took a go at it so quickly. I’m so happy to hear that. I ended up making several more after this post. I love making this one for friends. Hope you’ll make plenty more. Thank you so much for taking the time to let me know!